Put those backstage lighting skills to work! Although some may argue that there are too many puzzle games on the Wii's download service, it's always nice when a developer shows us a fresh concept in the genre. Studio Walljump recently treated us to a near-release version of its upcoming WiiWare title Liight and after a bit of time exploring what it has to offer we're happy to report that it looks like one of the more interesting and unique puzzlers on the system. 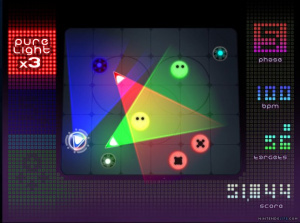 As the title implies, solving puzzles in Liight involves illuminating targets of various colours using the base elements of red, green and blue light in various combinations. Unlike pigments, red, green and blue light combine to make white light and combinations of any two will produce yellow, cyan and magenta. This may be a foreign concept for some, so there's a handy colour wheel for reference in the lower right corner throughout the "Solve" mode, in which you're tasked with solving 100 puzzle grids divided into four categories of difficulty. The Easy puzzles aren't very tasking and can be worked through in a relatively short span of time, thanks to relatively straightforward target placement and the visual cues that tell you when you're on the right track. Any target which is properly illuminated with the matching colour light will pulse gently with a white aura, and once all targets are properly lit up, the level ends. Higher difficulty levels become quite challenging with grids that have limited space to place your spotlights (often including multiples of some colours), barriers that block lights and "static" blocks that shouldn't be illuminated lest they fuzz out the catchy techno soundtrack that builds in layers as you correctly illuminate targets. 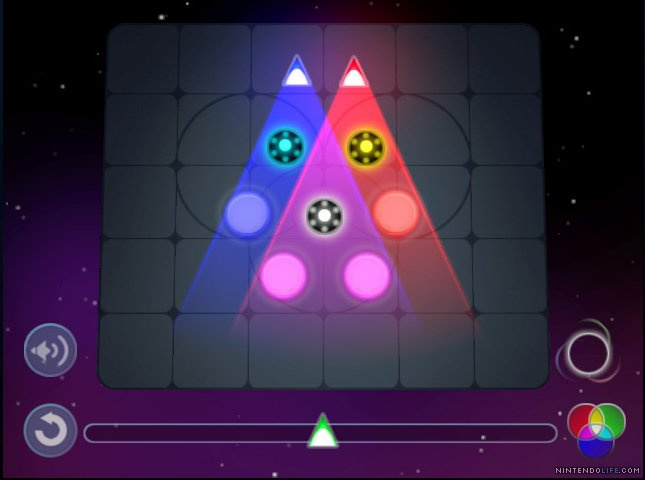 The "Medium" and "Hard" difficulties definitely aren't fooling around and you'll really need to get creative in your thinking, placing lights behind each other to block light from hitting one target whilst illuminating others. More complex still are puzzles in the "Extreme" difficulty category which place targets on concentric circles that can be rotated by clicking buttons in addition to more complex fixed arrangements. The controls match the relative simplicity of the game mechanics: using the Remote you point to move your cursor and hold to grab spotlights off the bottom edge of the screen for placement on the game grid; pressing and twisting the Remote will direct their beams. It won't be long before you're combining these actions for quick placement of the lights which is pretty important in the faster-paced "Nonstop" (endless) mode of play. Not everyone likes noodling about with brain-teasing puzzles, so the fine folks at Studio Walljump have thoughtfully provided an alternate mode in which players try to get their initials up on a local scoreboard for lighting up the most targets in one sitting. 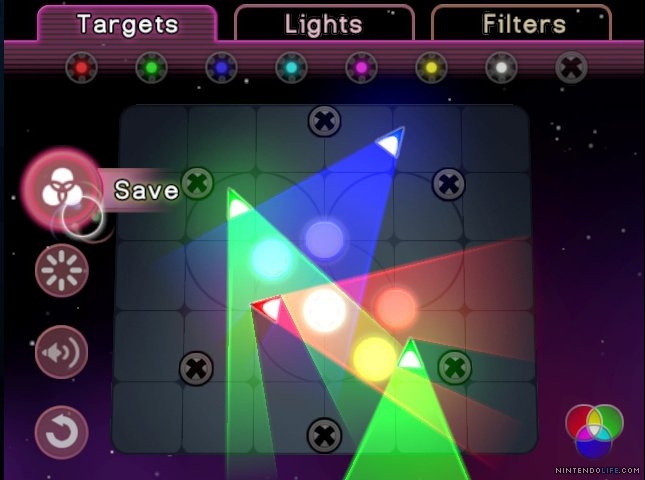 In Nonstop mode you have three spotlights and targets appear randomly on a grid which must be illuminated for several seconds before they disappear and you can light-up more. As you remove targets your "Phase" will increase, upping the pace of play which is reflected in the BPM of the soundtrack, helpfully indicated on-screen. There's no handy colour wheel, so you'll need to remember that green + red = yellow, adding to the pressure. Illuminating multiple targets in one go will get you more points, which will become increasingly necessary as letting targets pile up will result in a countdown to overload. Overload too many times and it's Game Over. The more arcade style gameplay makes for a nice change of pace and it feels more like a completely different game than a tacked-on variant play mode. Endless light play - if you're good enough! For fans of the brain-bending side of things you can create puzzles of your own and share them with friends. It looks like this will probably be via the usual friend codes, but just having the feature is pretty rare for a WiiWare title. The editor has the same elements you'll see in the built-in puzzles and is as simple as solving a puzzle on the fly before saving it with a title of your choosing; once saved you can play it like any other puzzle. You have an additional 25 slots for puzzles received from others, so between your own creativity and those of your friends you can have an extra 50 puzzles to play on top of the 100 which come in the box. 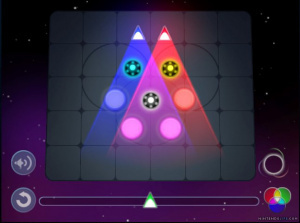 Based upon what we've experienced Liight looks like it will deliver a quality puzzling experience for those who like to take their time figuring things out as well as people who just want a quick bit of action to get a high score. We're told that outside of some last minute polish the game is complete and going through the first stages of the approval process, so we should hopefully see it later this year. Looks interesting...I might get this when it comes out. I'll keep this game on my radar at the moment, I just going to need a solid NLife Review before I dive into it. It seems ages since I 1st heard of this game; its been on my radar all this time. I'm glad it looks to have turned out good. Looks like it'll be a insta- from the 1st impressions alone. Been waiting around for this title for a little while, hope it's nearing its release. I'm still really looking forward to this. Cheers KS8, looks like we had an "a" wandering loose around here! I believe the game name is pronounced "light," but you know it's the Wii so every game title with an "i" has to have two! Thanks to everyone who has been waiting for Liight since we announced it ages ago. Sorry for the long delay, and I hope you all enjoy it when it comes out!!! Thanks for the Preview Sean!